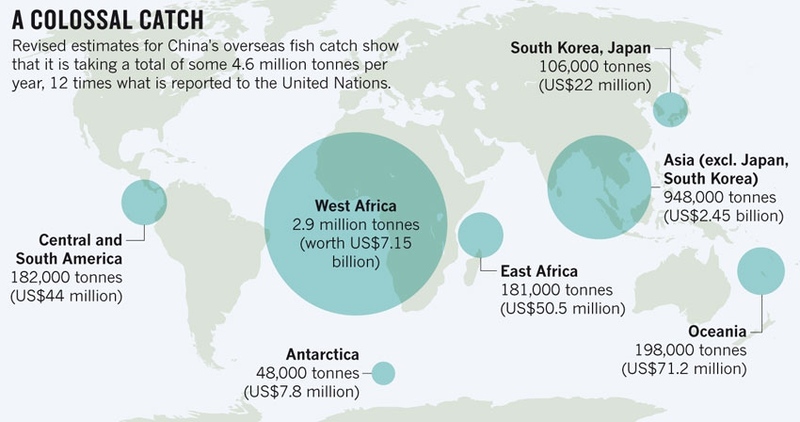 It is a whopper of a catch, in more ways than one: China is under-reporting its overseas fishing catch by more than an order of magnitude, according to a study published on 23 March. The problem is particularly acute in the rich fisheries of West Africa, where a lack of transparency in reporting is threatening efforts to evaluate the ecological health of the waters. “We can’t assess the state of the oceans without knowing what’s being taken out of them,” says Daniel Pauly, a fisheries scientist at the University of British Columbia in Vancouver, Canada, who led the study. The unreported catch is crippling the artisanal fisheries that help to feed West African populations, he says. Fisheries experts have long suspected that the catches reported by China to the Food and Agriculture Organization of the United Nations (FAO) in Rome are too low. From 2000 to 2011, the country reported an average overseas catch of 368,000 tons a year. Yet China claims to have the world’s biggest distant-water fishing fleet, implying a much larger haul, says the study, which was funded by the European Union (EU). Pauly and his colleagues estimate that the average catch for 2000–11 was in fact 4.6 million tons a year, more than 12 times the reported figure (see ‘A colossal catch’). Of that total, 2.9 million tons a year came from West Africa, one of the world’s most productive fishing grounds. Liu Xiaobing, director of the division of international cooperation of China’s bureau of fisheries, put the yearly overseas catch at 1.15 million tons in a speech to the EU last June. Pauly says that figure would be accurate if it referred to the amount brought back to China, rather than the total catch. Liu did not respond to an e-mailed request for comment. Fisheries scientists find the latest assessment startling. “So that’s where my fish were going!” says Didier Gascuel at the European University of Brittany in Rennes, France, who is a member of the scientific committee that advises Mauritania and the EU on fishing agreements. Year after year, Mauritanian populations of bottom-dwelling species such as octopus, grouper and sea bream have remained stubbornly low — a sign of over­fishing by bottom-scraping trawlers, he says. “We had no idea the Chinese catch was so big and of course we never included it our models,” he says. Fishing contracts between Chinese companies and African nations are secret, so to estimate the catch, Pauly and his team had to do some sleuthing. The picture was further clouded because Chinese companies sometimes operate vessels flying local flags. So at least ten researchers combined clues from field interviews, scholarly articles and newspaper and online reports in 14 languages to estimate how many Chinese fishing vessels were operating in 93 countries and territories. They found many in nations where China reported no catch. The estimates were averaged to reach their conclusion: China had at least 900 ocean-going vessels, with 345 in West Africa, including 256 bottom-trawlers. Other experts are skeptical. “The new estimates seem far, far too high,” says Richard Grainger, chief of the fisheries statistics and information service at the FAO. He notes that a previous assessment estimated the total unreported catch in West Africa (by all nations) at 300,000–560,000 tons a year. That study tried to identify what was missing from official catch figures with a review of English-language scientific studies. Gascuel, who helps to determine how many fish can be caught while avoiding population collapse, says that numbers of octopus and shrimp available to be taken in EU contracts with Mauritania, primarily by Spanish vessels, were already small. But once the actual Chinese catch is factored in, he says, “we’d have to eliminate the Spanish catch”. Ironically, it was Pauly’s team that 12 years ago found that China had been over-reporting its domestic catch by at least 6 million tons. Pauly says that mid-level bureaucrats in the country often exaggerate their achievements. This article is reproduced with permission from the magazine Nature. The article was first published on April 2, 2013. Can Climate Change Cause Conservation?